Sylvester is a young donkey who lives with his parents and spends his time collecting pebbles. He is exploring one rainy day when he finds a bright red, round, shiny pebble. As he looks it over, he wishes it would stop raining - and it does! Sylvester makes a few more trial wishes, and all come true while he is holding the pebble. He’s excited to show his parents and friends, but on the way home he encounters a hungry lion. Flustered, Sylvester doesn’t wish for the lion to disappear, but wishes he was a rock, and therefore safe from the lion. Because of the magic pebble, Sylvester indeed becomes a rock. And because he is a rock, he can no longer hold the pebble and make wishes. He stays a rock for a long time; his parents worry and question the townspeople, but no one has seen Sylvester. The young donkey remains a rock as the seasons change. His parents have never gotten over their son going missing, but one summer day, they decide to have a picnic. They find the perfect rock to sit on, and it just so happens to have a bright red pebble next to it! Will his parents wish Sylvester back into his regular form, or will he stay a rock forever? The primary theme of Sylvester and the Magic Pebble is how children may wish for foolish things, and how that affects those around them. 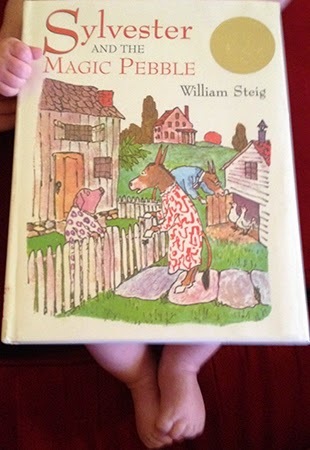 It is a beautifully written story, with anthropomorphized animals acting out the parts: Sylvester and his parents are donkeys; the police are pigs; neighbors are chickens, cats, and dogs. Most wear clothes and act like humans do - Sylvester’s mother wears a dress and knits, and his father wears a suit and smokes a pipe. The emotions on the animals’ faces are very expressive, and help add suspense and sadness to the story while Sylvester is missing. The illustrations look timeless, and have helped this book become a classic. The clean black lines make the vivid colors pop as Steig shows the change of seasons. Instead of the more traditional layout of pictures on the top part of the page and text at the bottom, Steig puts smaller pictures around the text on several pages. This helps the story flow through the illustrations, because they are not separate from the text and inspire the reader’s eyes to explore the page. I had forgotten that all picture books weren’t silly! Sylvester and the Magic Pebble has an undertone of sadness, with Sylvester wishing himself home in his old body, and his parents missing him fiercely and searching for him incessantly. These emotions were expressively displayed in Steig’s illustrations of the characters, and really helped the sadness hit home. In fact, I think the illustrations were my favorite part. Nothing against the story, which was well-written and entertaining enough, but the illustrations are very vivid and colorful. They can’t tell the story by themselves (how would readers know the pebble is magic and that Sylvester turns himself into a rock? ), but they really enhance the story, which wouldn’t be the same without them. - Sylvester likes to collect colored pebbles - what do you like to collect? - If you had a magic pebble, what would you wish for?